This is not your typical Orange Crush 35RT Guitar Amp dust cover. Our premium quality Orange Amp Dust Covers protect from animal hair, dust, spills and other kinds of nuisances that can shorten the lifespan of your amp. 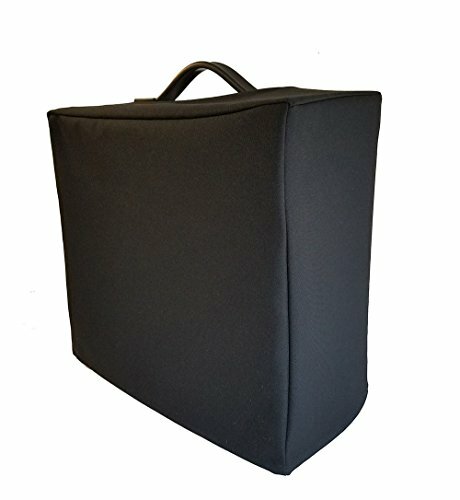 All of our dust covers are custom made for each model of guitar amp on the market. We don't believe in 'One-Size Fits All' amp dust covers. Our customers have told us, they don't want a dust cover made with the cheap, translucent vinyl material that can discolor, dry out and crack. Just like you, they want something that looks professional, and does the job! In other-wards they want a higher class guitar amplifier dust cover that meets their needs. Advantages: Lower cost, washable, & ironable for a crisp, clean look. This cover will also keep it safe from small, accidental spills. 2. Premium Water-Proof Fabric - Not as soft as our twill fabric, but, looks great! Advantages: Wipes clean with a damp cloth. Spill a gallon of coffee on it, or leave it under the sink all day and the water will deflect off, thus protecting your equipment. * Easy to slip over your amp. * Our covers are designed with an opening on top for easy access to the handle. * Sewn w/ industrial sewing machines - creating strong, durable seams & stitches. These covers are designed to last! Don't see your cover? Message us or check our other listings. This is our black, water-proof fabric listing. PROTECT YOUR Orange Crush 35RT Guitar Amplifier From Dust, Animal Hair, Scratches, Spills & More! CUSTOM MADE - We Don't Believe in 'One Size Fits All' Orange Guitar Amplifier Dust Covers! Sized For Your Exact Model. CHOOSE FROM Our Premium Twill or Water-Proof Fabrics. EASY TO CLEAN! Our Twill Fabric is Machine Washable, Dryer Safe & Ironable (It won't shrink either!) Our Water-Proof Fabric is well . . . Water-proof. Wipe With a Damp Cloth to Clean. FREE SHIPPING in the United States! 30-day, 100% exchange/return policy! Manufacturer: Dust Covers For You! Brand: Dust Covers For You! Publisher: Dust Covers For You! Studio: Dust Covers For You! If you have any questions about this product by Dust Covers For You!, contact us by completing and submitting the form below. If you are looking for a specif part number, please include it with your message.